Bioturbation is an important ecosystem process, and the loss of native digging mammals due to introduced predators and habitat loss may have detrimental consequences for ecosystem health. The mycophagous woylie (Bettongia penicillata ogilbyi) was once widespread across the Australian continent and currently exists in a greatly reduced range, while the omnivorous quenda (Isoodon fusciventer), which once occurred across the southern part of Western Australia (WA), remains common in south west WA over a reduced range. Populations of these two digging marsupials are currently maintained within sanctuaries where they can reach high densities. To assess the influence these digging marsupials have on fungal assemblages, we investigated fungal root associations among seedlings of a key mycorrhizal forest canopy species, Corymbia calophylla, R. Br. K. D. Hill and L. A. S. Johnson. Seedlings were grown in soil collected from inside (heavily-dug soil) and outside (minimally-dug soil) two predator-proof sanctuaries. Our results showed that above-ground seedling biomass was significantly greater for seedlings grown in soil collected from inside the sanctuaries. There were no differences in the diversity or species richness of rhizosphere fungal communities isolated from these seedlings; however, the community composition was significantly different. This was most obvious for the predator-proof enclosure that had been in place for 20 years (Karakamia Sanctuary) compared with the more recently-installed Perup Sanctuary (fenced in 2010; 4 years before this study). At Karakamia, there were greater numbers of putatively hypogeous ectomycorrhizal fungi inside the enclosure and four times the number of operational taxonomic units of arbuscular mycorrhizal fungi outside the enclosure. The differences in fungal communities suggest that digging mammals play a pivotal role in ecosystem functioning by influencing the rhizosphere of this key forest canopy species, which has implications for maintaining the health and persistence of forests. The online version of this article ( https://doi.org/10.1007/s10531-018-1575-1) contains supplementary material, which is available to authorized users. 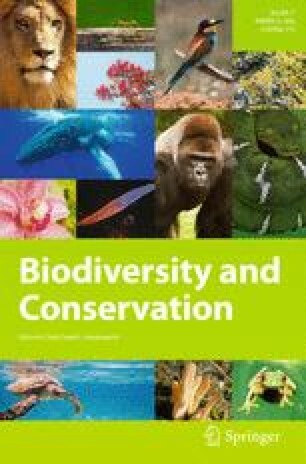 The authors would like to thank Bryony Palmer and Mike Smith from the Australian Wildlife Conservancy (AWC), and Adrian Wayne, Julia Wayne and Mark Virgo from the Department of Biodiversity, Conservation and Attractions for facilitating entry into the sanctuaries and for providing unpublished trapping data. We would also like to thank Pat Dundas, Judy Gardner (Scion, New Zealand) and Yvonne Lau for help collecting soil samples in the field. Thank you to the two anonymous reviewers who provided constructive comments to improve the manuscript. Support for this project was received through a Murdoch University Small Grants Scheme. SD, AH and KR were funded through the State Centre of Excellence for Climate Change, Woodland and Forest Health, which is a partnership between private industry, community groups, universities and the Government of Western Australia.